Polycoria is a condition in which there are two or more pupils in the iris of the eye. The presence of an extra pupil disturbs the vision. Eyes having polycoria are not the normal eyes because the eye is already damaged. This can happen when the pupil of the iris is displaced or closed peripherally. Then another pupil can be made surgically. Polycoria can cause the eye to focus on multiple offset images to view a correct image. Sometimes the image focused is blur and sometimes many images are formed on macula. 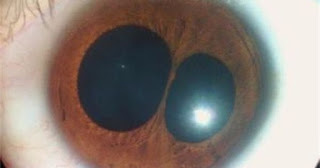 In this condition the iris is not able to contract and expand properly and it is difficult to achieve low light vision and high light vision. 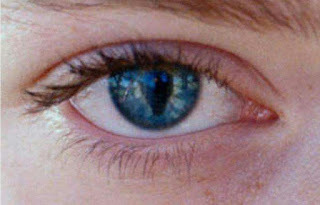 In polycoria there may be only one pupil which receive the clearest image of the scenery the other pupil can’t make it due to less light capturing ability. Polycoria is extremely rare. There should be an intact sphincter muscle in every pupil of the iris. Polycoria can be in one eye or in both the eyes at a time. The actual pupil should be on its place to obtain an image if it is not, then there will be no proper image. The reasons behind polycoria are very rare, one of them mostly reported is axenfeld rieger syndrome. This syndrome can cause many openings in iris. Polycoria can also be caused by hypoplasia (a condition in which there is incomplete or underdevelopment of tissue or organ), hyperplasia (abnormal enlargement of an organ or tissue), stroma (the supportive tissue of an epithelial organ, consist of connective tissues and vessels), surgical or accidental trauma, ICE syndrome is also responsible for polycoria. Penetrating trauma is another major cause or polycoria but sometimes the blunt trauma is also responsible for polycoria. Severe inflammation is another cause. • Confusion with object images. There are not any medications or the treatment of polycoria but a surgical treatment. The multiple holes in iris can’t be set right without surgery. So pupilloplasty is the only surgical treatment or polycoria. Before surgery the BCVA of both eyes are checked and also the sphincter of pupil are checked and then decide whether it is polycoria or not. For surgery the topical anesthesia is given and a small incision is made on the muscular tissue of the sphincters of multiple pupils in iris. After surgery, the patient have to administer levofloxacin and dexamethasone for two weeks’ time.